As usual the Magic Tree House doesn’t disappoint. Jack and Annie are sent to Mexico during the 1970 World Cup soccer game to discover the secret of greatness. Merlin has sent them on another mission. 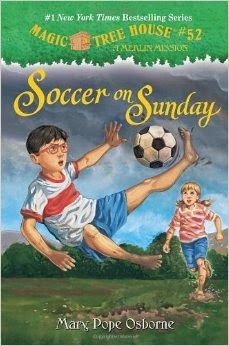 They meet a charming local boy name Roberto who is a soccer fanatic. He shows them to the way to the stadium. It’s Roberto’s birthday and his family has bought him a ticket to the game even though his family can’t afford for the rest of them to go. It proves to be an exciting adventure of friendship, soccer excitement and the key to discovering your greatness. You expected the kids to actually be able to meet a famous soccer player and yet she weaves the story perfectly and still helps them accomplish their mission. Spier, Peter. 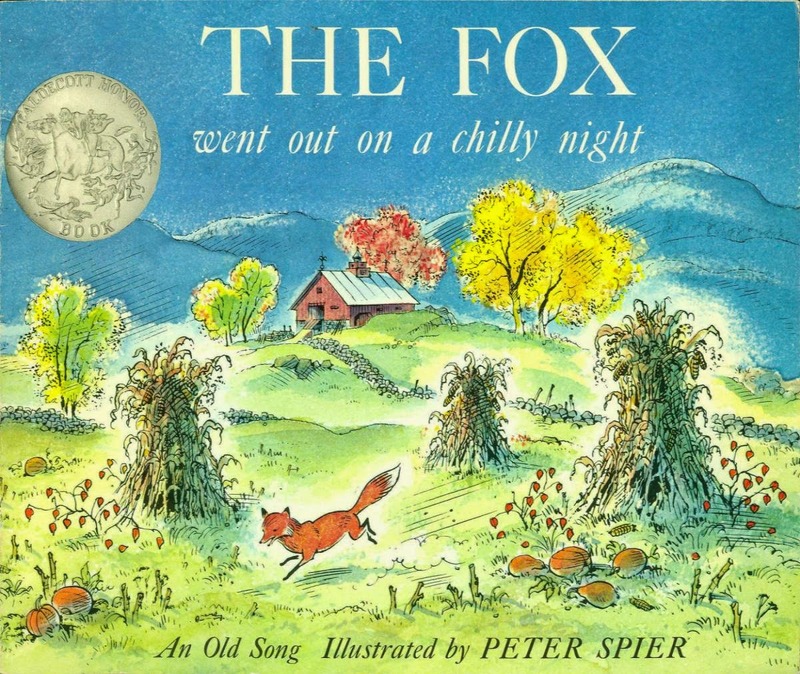 The Fox Went Out on a Chilly Night, PICTURE BOOK, 2014. 17.99. Content: G.
This book is a picture book version for the folk song of the same name. A fox goes out into the night to find a tasty meal for his fox family. He gets away with a goose and a duck and escapes to his home where his wife prepares the fowl and the family eats like kings. The illustrations in this book are stunning! I’m not surprised that it is a Caldecott Honor Book. There are a few illustrations however, that I think might be somewhat disturbing to certain children. The song and pictures depict the fox biting the necks of the birds and then plucking them at home in his den. There is no blood and it’s not particularly violent, but I can just imagine a student being horrified by this. It’s really a shame because the pictures are so beautiful. Perhaps I’m being too cautious, but I err on the safe side. Boyle, Bob Rosie & Rex: A Nose for Fun! PICTURE BOOK. HarperCollins Publishers, 2014. $15.99. Content: G. Rosie and Rex love to play together and are great friends. While trying to decide what to do for fun one day, Rex wants to play robots but Rosie insists that everyone knows ROBOTS ARE NOT FUN! Rosie and Rex set out on an adventure trying to find something that both of them will enjoy. They stumble across an unknown object. Rosie thinks it is a pretty flower vase but Rex insists it’s a cool robot blaster. Rosie thinks it could be a special sippy cup but Rex thinks it is a robot helmet. Rosie and Rex use their imaginations to try to figure out this unknown object’s true purpose. At the end of the story, the object is correctly identified with a fun and exciting twist in the story. Little ones will love the ending to this story. Parents will love the life lessons taught in this simple and wonderful story. Pre-K. EL (K-3). ADVISABLE. Reviewer: SL. 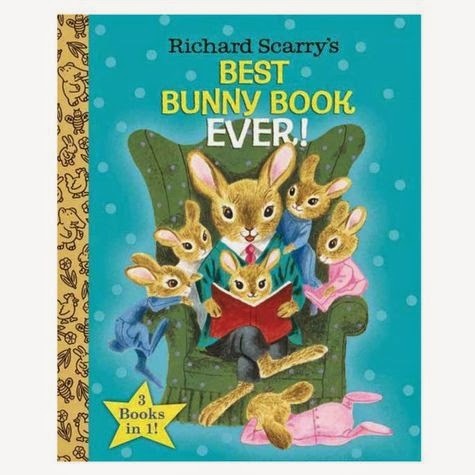 Scarry, Richard Best Bunny Book EVER! PICTURE BOOK. Random House Children’s Books, 2014. $6.99. Content: G. This Richard Scarry collection has three classic stories: Naughty Bunny, Bunnies, and The Bunny Book. With Scarry’s incredible illustrations, these three stories will bring a lot of enjoyment and snuggle time with little children. Naughty Bunny is a fun story about how much mischief little bunnies can get themselves into. Mother is exhausted at the end of each busy day and hopes someday her little Bunny will behave better. One day Bunny tries extra hard and almost succeeds in being the best bunny ever. At the end of the day, he presents his mother with a beautiful paining on her wall. Mother bunny is actually thrilled with the sentiment and hugs little Bunny in spite of his choice of where to paint. Bunnies is a quick and colorful story or review of different types of bunnies and their characteristics. The Bunny Book is a fun story about what baby bunny wants to be when he grows up. The ending to this third story is heartwarming and tender. We enjoyed this book as much as we have enjoyed any of Richard Scarry’s classics. Pre-K. EL (K-3). ADVISABLE. Reviewer: SL. At the end of the last school year Roan found out some amazing news, he is so eager to get back to school that he shows up early! He comes in confident in his abilities, friends, and crush. But things start to go wrong, and Roan is just not sure how to fix everything. In desperation he even befriends the school bullies, and he ends up in quite a bit more trouble. It seems like he is always messing up, and the class he wants to do the best in seems to be his most challenging one. Will Roan end up friendless and failing? This one was almost a better read than the first one. 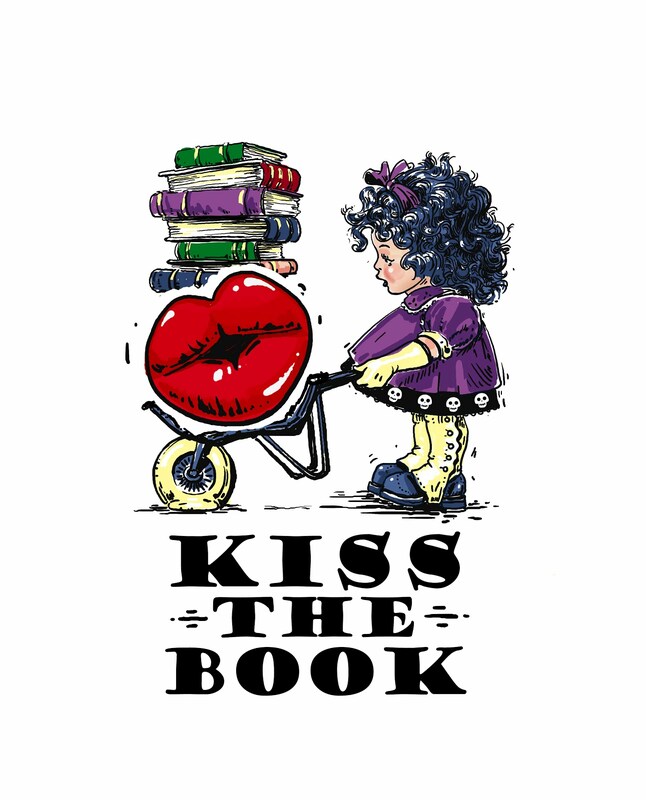 There was a little more heart and life lessons (which librarians and parents just adore). I found myself looking forward to the feature called “ “Things Yoda said this week”. I really think the author does a great job developing characters including Roans family, with letters from home that are awesome. 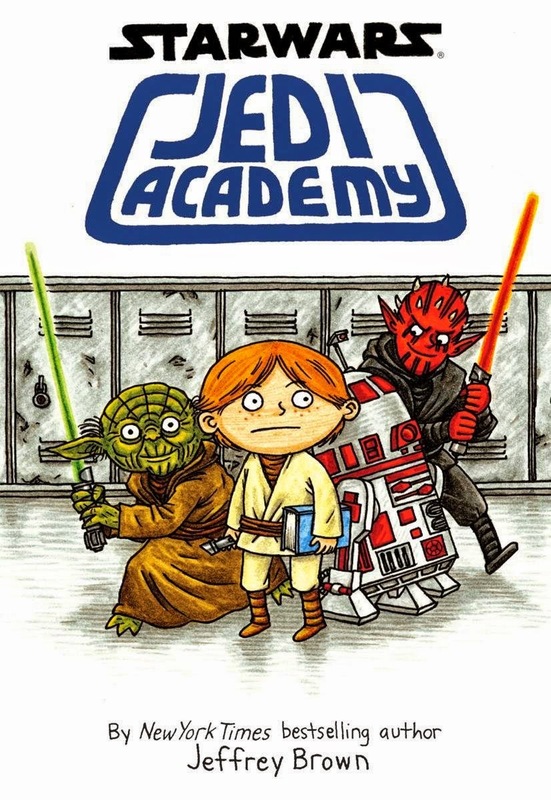 My new favorite series, a must buy for reluctant readers in 2-4 grade. Set in the Star Wars Galaxy, Roan is a 6th grader on the planet of Tattooine, all in wants in life is to go to the Pilot Academy like his big brother, so they can become pilots, like their dad. Roan is denied acceptance and is crushed. Then he receives a letter accepting him to the Jedi Academy. He doesn’t know that much about it but its better than going to the agricultural academy. Because he is starting a bit older than the other students, he has to make friends and catch up in skill to everyone else. Will he ever be able to use the force to life objects? Will he ever be able to understand Master Yoda? What about blowing up stuff like his friends at the Pilot Academy? Told in journal format this book presents Roan’s first year in school in illustrated comics, letters, blurbs, and newspaper tidbits. Give me this series ANYDAY for reluctant readers over Captain Underpants. Get this series and its guaranteed to be popular with 2-4 grade boys. I sorta avoided reviewing this, because the comics/text is microscopic on many pages, but it was totally a fun read! 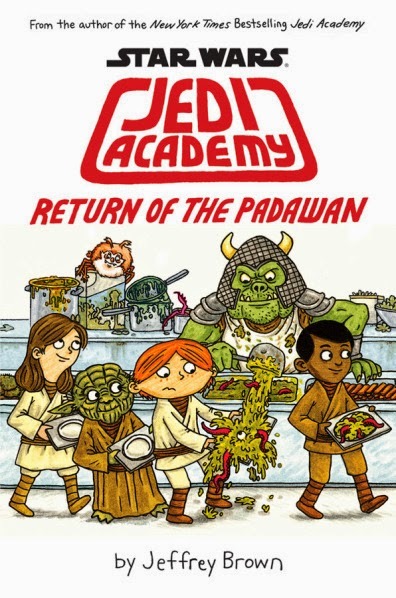 I think star wars fans will adore this series, and its really geared quite well for younger readers. You know it’s a good book when you find yourself wishing it was longer. Although the main character is in 6th grade I just think there isn’t enough plot/adventure for upper elementary readers. Though its wholesome enough for even second graders. I am adding this series to my library as fast as I can. 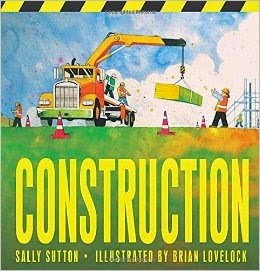 Sutton, Sally Construction Illustrated by Brian Lovelock Candlewick Press, 2014. PICTURE BOOK $15.99 Content: G.
This book follows the different construction steps of building a library. Each page spread has a rhythmic explanation of what each step is, including sound effects to be read. The illustrations are bright and show workers putting up the building. At the back of the book there is an explanation about the different parts of the construction workers outfit and what the different machines do. My little boys think this book is awesome-they love reading books that show construction trucks and the enjoyed following the building of the library. 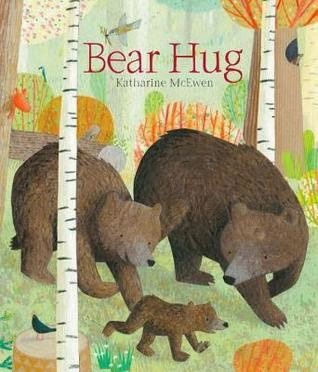 McEwen, Katharine Bear Hug Templar Books, 2014. PICTURE BOOK $15.99 Content: G.
A bear comes out of his cave and eats fish and berries. He finds another bear and they prepare for the winter and sleep in a bear hug in their cave. When spring comes they wake up and have a bear cub. They teach the cub how to catch fish and gather leaves for their cave. The seasons change and all three bears go back to the cave and sleep for the winter in a bear hug. The illustrations are beautiful and attractive. The storyline is predictable and basic-not too much development. I guess my hang up with this book is that bears don’t hibernate with a mate and male bears don’t teach their cubs anything (they actually try to eat them) and although this is a fictional picture book, it didn’t have enough story to make it fiction and it felt like the author was trying to explain a bear’s life-which wasn’t even close to truth.